Dumdum Motijheel College (Women’s Morning Section general course & Day Section) ,one of the best general degree college in North 24 Parganas, affiliated to WBSU Barasat, invites Online Application for Admission to Under Graduates Honours/General programme Courses for Academic session 2018-2019. Check Dumdum Motijheel College Provisional/Final Merit List 2018. Acharya Prafulla Chandra College, well-known as APC College, is one of the best general degree college in Kolkata, affiliated to West Bengal State University, Barasat, invites Online Application for admission to Under Graduates (UG) B.A/B.Sc and B.B.A Honours/General courses under new CBCS Syllabus for academic session 2018-2018. Check Kolkata APC College Provisional/Final Merit List 2018. Surendranath College, Sealdah, is one of the most popular degree college in Kolkata , affiliated to University of Calcutta , invites Online Application for Admission to Under Graduates B.A/B.Sc/B.Com (for Morning, Day & Evening Section) under New CBCS (Choice Based Credit System) Syllabus for 2018-2019 Academic Session . Check Kolkata Surendranath College Merit List 2018. Chittaranjan College, One of the best General Degree College in Kolkata, affiliated to University of Calcutta, invites Online Application for Admission to Under Graduates Honours/General Courses under new CBCS Syllabus for academic session 2018-2019. Check Chittaranjan College 1st Merit List 2018. 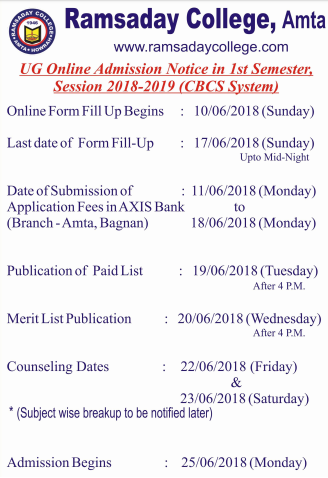 Ananda Mohan College ,affiliated to Calcutta University, invites Online Application for Admission to Under Graduates Honours/General Programme Courses under new CBCS Syllabus for Academic session 2018. 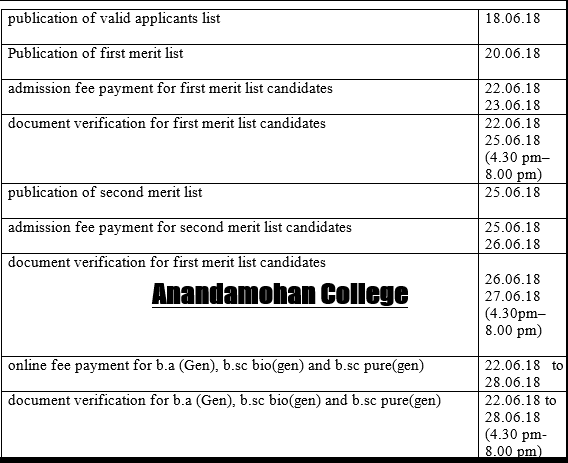 Check Ananda Mohan College first Merit List 2018.